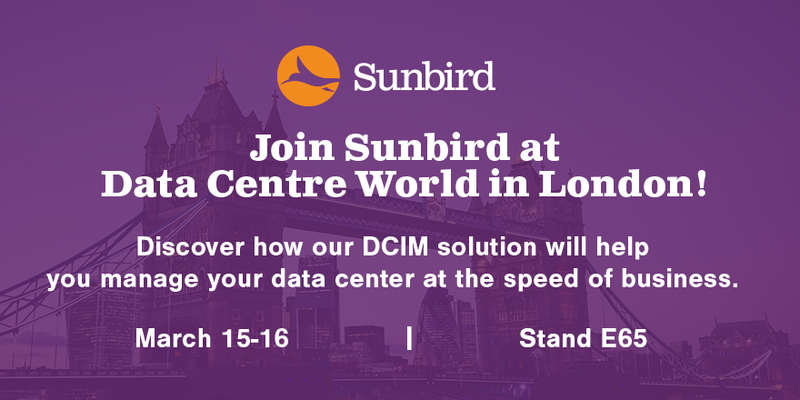 Sunbird is thrilled to be attending Data Centre World at ExCeL London from March 15-16, 2017. Stop by Stand E65 to meet our data center industry experts and get a demo of our award-winning Data Center Infrastructure Management (DCIM) solution. See for yourself how our thermal map and time-lapse video, interactive dashboards, and enhanced failover reports simplify your data center management. Want to learn more about how to leverage the data from your data center? Explore this topic and more at our session on Top DCIM Dashboards for Tackling IT Operational Challenges, Thursday, March 16 at 11:15 AM. Register to attend DCW London now to make sure you don’t miss it! Best practices for creating dashboards that track the most useful metrics for successful data center optimization. Proven strategies for successful DCIM implementations. Real-world examples of how DCIM can provide a wide range of security, inventory, networking, and connectivity intelligence in a single-pane-of-glass view. Want to attend Data Centre World London? Register today to reserve your spot. Heading to Data Centre World in London and want to chat one-on-one with a DCIM expert? Our local Sunbird representatives will be available for individual meetings. Let us know if you’d like to meet.